Sir Elliot | Thoughts, Ideas, Inspirations. With the recent events that has occurred in Japan, I do hope my friends are safe. I recommend the following websites for those looking for status reports. David Tong has created a beautiful song dedicated to the tragedy in Japan. Do have a listen! Welcome to my “Blog.” On this page, you will embark the illogical side of Sir Elliot. Hopefully you will find my Audio jargon entertaining for, my girlfriend does not. One of the many things I like to create is VST Plug-ins. The concept behind my plug-ins is hardware based. Many developers aim for a transparent sound. I, on the other hand prefer a sound that is coloured. My designs reflect that kind of topology. The percentage rating of my plug-ins offering a flat frequency response upon inserting it in your DAW is very low. I am most fond of the sound found in audio equipment created from the late 1930’s to the end of the 70’s which, I try my best to replicate using Synthmaker. The terms “Transparent,” “Colour,” “Warm,” in addition to “Musical” are, non-technical definitions that many non-technical audio users choose to say when describing a particular tone. I will always use quotation marks when using those words to express the tonal characteristics of an audio design. It is far easier for the non-technical-audio-user to understand such words even though, such terminologies are not labeled on hardware devices. Being one who likes to move to beat of his own drum, I have no interest in replicating another “insert a brand that many tend to gloat about” plug-in. I explored the idea once, which became my least favourable design. It appears it is either a lack of imagination or minimum experience with audio hardware why the market is so saturated with products that follow almost the same thumbprint. As of the first of January 2014, all new designs will be compiled using C++. Older designs created from 2013 – 2008 will be updated (if need be) using Synthmaker. All designs created from 2013 – 2008 have been thoroughly checked to function to its specifications on Microsoft’s Windows 8 Operating System. All new designs created in 2014 using C++ platform will be compiled on Windows XP Service Pack II on a Pentium IV, 3 GHZ CPU. All plug-ins are crafted on, a Pentium 4, 3 GHZ CPU, utilising a Windows XP Service Pack III platform. The maximum continuous average consumption should be no greater than 20% using 88200, 24-bit wav files. Plug-ins that exceeds 20% on a continuous average basis, using 88200 24-bit wav files, are not offered to the public. The continuous average consumption is always based on a Pentium 4, 3 GHZ Computer. VST plug-ins designed from September 2011 onwards, will not support 48 kHz and below sample rate audio files. All plug-ins are crafted on, a Pentium 4, 2.8 GHZ CPU, utilising a Windows XP (non-service pack) platform. The maximum continuous average consumption should be no greater than 10% using 44100, 16-bit wav files. Plug-ins that exceeds 10% on a continuous average basis, using 44100 16-bit wav files, are not offered to the public. The continuous average consumption is always based on a Pentium 4, 2.8 GHZ Computer. All plug-ins are compatible with Windows 2000 onward. All Equalisers & Preamplifiers are designed to alter the frequency response (“Colour” the sound) upon insertion of the effects chain regardless if the tone controls are set in a flat (0 dB) position. You may find a video demonstration of my plug-ins quite useful. I have created videos on all my designs that will enable you to get an understanding on not only how my plug-ins work, but how they sound as well. My earlier designs pre-dating the Universal Compressor can be found using the link below. There will be no replacements for the above Compressors. Future designs and or modifications will consist of Equalisers, Preamplifiers in addition to Limiters. The decision is based solely on business purposes and, does not constitute to any malfunctions of Sir Elliot Altered Dynamics Series II, Sir Elliot Little Black Box Series II and/or Sir Elliot Universal Compressor. For those that continue to use Sir Elliot Altered Dynamics Series II, Sir Elliot Little Black Box Series II and/or Sir Elliot Universal Compressor, rest assure these are still supported if you encounter any issues until the 31st of December 2013. As all of my designs have been tested on Windows 2000, Windows XP, Windows Vista in addition to Windows 8 32-bit operating system, Sir Elliot Altered Dynamics Series II, Sir Elliot Little Black Box Series II and/or Sir Elliot Universal Compressor will continue to function once support has ended. I would like to introduce Sir Elliot 35-Band Mastering Vocal Equaliser. 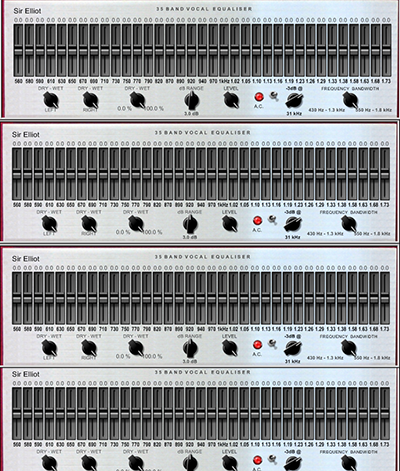 Sir Elliot’s 35-Band Mastering Vocal Equaliser is designed for Mastering Engineers who need to focus on midrange frequencies within the 440 Hz – 1760 kHz range. More bands enables more precision to pinpoint on bringing a particular vocal or instrument in the midrange region to the forefront. Up to 44 frequency bands ranging from 440 Hz – 1760 kHz when using two 35-Band Mastering Vocal Equalisers in parallel. Three Dry/Wet contours for Left, Right in addition to Stereo. Note: 1.5 dB uses 0.01 dB increments while, 3 dB & 6 dB range uses 0.1 dB increments. Power Consumption is based on a single-core, 2.8 GHZ Pentium 4 Computer playing a sweep able sine wave wav file. Please visit the Global Download Section to Download Sir Elliot’s 35-Band Mastering Vocal Equaliser. Power Consumption: 7% on a single-core, 3 GHZ, Pentium 4 CPU residing on Windows XP SP3 using a 44.1 kHz white noise audio file. The GPA-2 is best suited for Jazz, Rhythm & Blues, in addition to Lounge Music. Coming Soon from Sir Elliot on Vimeo. Sir Elliot GPA 2 from Sir Elliot on Vimeo. If the GPA-2 sounds pleasing to your ear, you are more than welcome to use it for as long as you like. 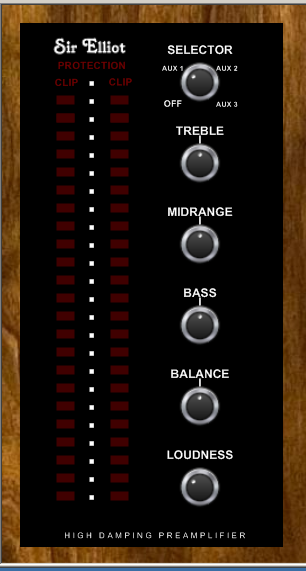 Sir Elliot’s Eighteen Band Graphic Equaliser now features an extended high (EH) frequency contour. With the extended high frequency contour, more prominence will be accomplished on cymbals even under low sample rates such as 44.1 kHz. CPU Consumption is based on a Pentium 4 single-core 3 GHZ computer using Windows XP (Service Pack III) operating system. If Sir Elliot’s 18-Band Equaliser EH sounds pleasing to your ears, you are more than welcome to use it as often as you like. Feel free to contact me using the PM system on Gearslutz if you have any questions regarding my plug-ins. Sir Elliot Eighteen Band Graphic Equaliser EH from Sir Elliot on Vimeo. In addition to a broader bandwidth from its ancestor, Sir Elliot’s Brass Instrument Equaliser Series II offers overtones, which co-relate to the tuning frequencies. High Frequency & Low Frequency – 3 dB point filters allows you to roll-off frequencies ranging from 10,000 kilocycles to 60,000 kilocycles per second in addition to 2 cycles to 100 cycles per second. 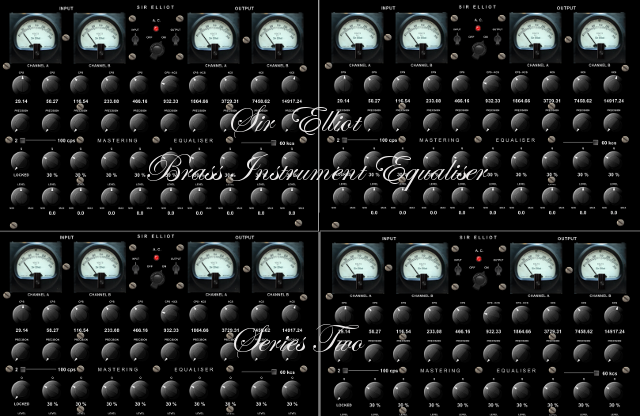 Sir Elliot’s Brass Instrument Equaliser Series II a Mastering plug-in aimed for Jazz, Classical & Dance music.